Tattoos in Hebrew have become very popular. I see them everywhere. 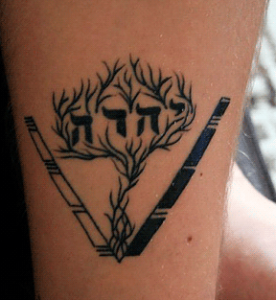 Unfortunately, very few tattoo artists can actually read or write Hebrew, and this has led to a lot of misspelled and mistranslated Hebrew tattoos. Below is a tattoo on the arm of a man in Bentonville, Arkansas. He thought his tattoo meant ‘strength’ in Hebrew. It actually says ‘matzo.’ He had this tattoo on his arm for years before he found out the true meaning after he met a real Jew for the first time in his life, who translated it for him. The other picture is that of a more commonly misspelled Hebrew tattoo. The tattoo artist made a small mistake in the shape of one of the letters. This tattoo is supposed to be the name of God in Hebrew. Instead it says: ‘He shall be pregnant.’ This is not an isolated case. It appears that there are many other people in the United States, mostly fundamentalist Christians, with tattoos on them that say ‘He shall be pregnant”. 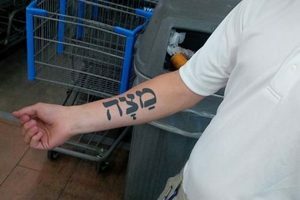 Misspelled Hebrew tattoos have been seen all over the U.S. There are several web sites that just show pictures of misspelled Hebrew tattoos. Here is one of these web sites. Bad Hebrew Tattoos. Jews and Tattoos. The Bible prohibits Jews from getting tattoos. In the Book of Leviticus it says: “You must not put tattoo markings upon yourself.” This line was part of a larger prohibition against idolatry. At the time the Old Testament was written, it was a common practice in the Middle East for people to tattoo the names and images of their gods on their bodies. Up until World War 2, it was generally only the orthodox Jews who took the Biblical prohibition on tattoos seriously, but after the war, tattoos became a taboo for Jews everywhere. Immediately upon entering Nazi concentration camps, Jews were tattooed with numbers on their arms. After the war, tattoos became an unpleasant and unwanted reminder of the Holocaust for Jews. 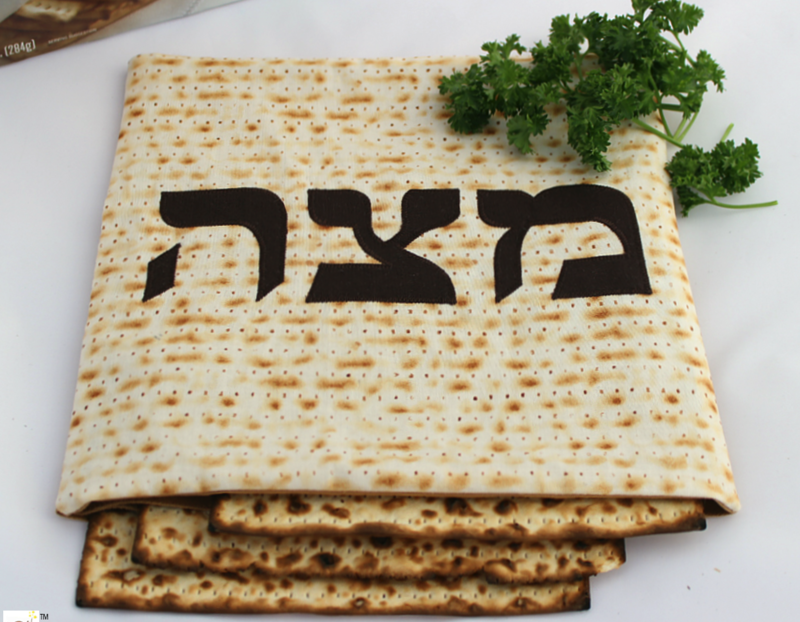 Today, it is virtually impossible to find a tattoo artist who is Jewish or who can actually read Hebrew.